Dog found battered and bloodied "may have been in a dog fight"
The dog, who is named Garth, is now recovering at an ISPCA facility. A DOG FOUND bloodied, beaten and abandoned in Dublin last week may have been used in a dog fight, the ISPCA says. 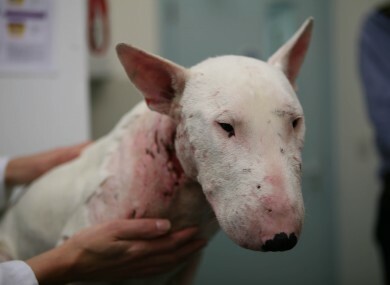 Garth, an English bull terrier, was found in the Finglas area last week by a member of the public. He was discovered lying at the edge of a park and brought to the nearby Irish Blue Cross mobile veterinary clinic. A veterinary examination by surgeon Thomas Taras quickly revealed he had multiple severe wounds to his neck, throat and front legs consistent with bites from another dog. The Blue Cross put Garth on the road to recovery by cleaning his wounds and administering antibiotics. Garth, who is named after that singer, shows signs of being a well-trained house pet, the Blue Cross says. The Irish Society for the Prevention of Cruelty to Animals (ISPCA) has begun an investigation into how Garth came to be in this position and will take over from The Irish Blue Cross and continue his rehabilitation and rehoming. But, from an assessment of the dog and his injuries, we do not believe that he willingly engaged in a fight with the other dog involved. We would really like to identify those responsible for putting Garth in the position whereby he suffered these atrocious injuries and hold them legally accountable for their actions. Garth is now at the ISPCA’s national rehab facility. Email “Dog found battered and bloodied "may have been in a dog fight"”. Feedback on “Dog found battered and bloodied "may have been in a dog fight"”.